A “rule of law program” involving the Blair team aims to help the Palestinian Authority(PA) “expand the scope of its legal and security footprint” in the occupied West Bank. In order to achieve that goal, the team is “lobbying” Israel to “reduce military incursions” into the towns and cities where most Palestinians in the West Bank live. 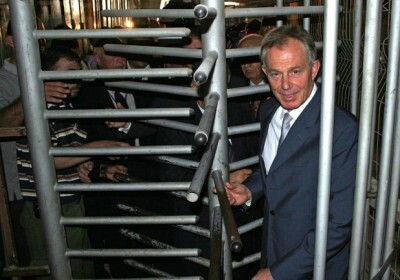 Like many others, I find it obscene that a man who helped launch the invasion of Iraqmasquerades as a peace envoy. Even if Blair isn’t drawing a salary for that work, it is unacceptable that he can still dine at the taxpayer’s expense.